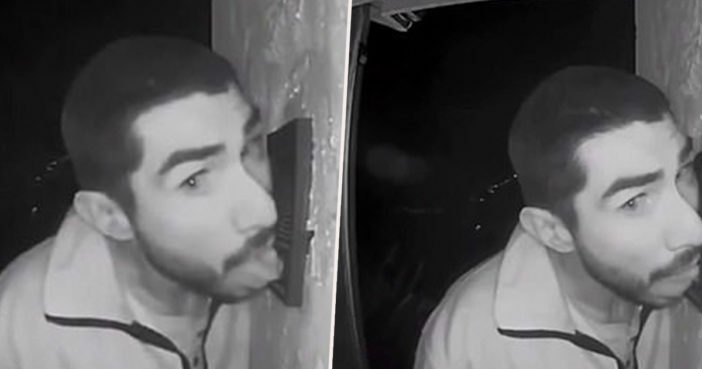 While many of us would prefer a polite knock at the front door, bizarre surveillance footage has emerged showing a man eagerly licking the doorbell of a stranger’s home. And this was clearly an activity he enjoyed. The suspect in question – now named as Roberto Arroyo – spent three hours hanging around the family home in California, licking the door bell and apparently relieving himself in the front garden. The homeowners, Sylvia and Dave Dungan, had been out of town at the time of the unusual act of trespass, but their children had reportedly been asleep inside the house. I thought, boy there’s a lot of traffic. I go, 5:00 in the morning? My son doesn’t get home till 6:00 a.m. well then who the heck is that? 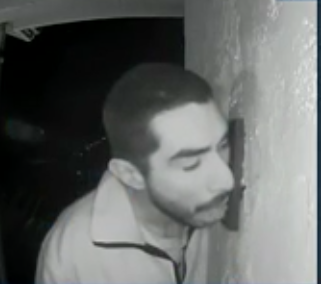 Footage showed Arroyo licking the doorbell as lovingly as if it had been a spoonful of peanut butter. It has not been disclosed whether or not he licked it hard enough to ring it. Fortunately, the high quality picture of the surveillance system – which had been installed only one month prior to The Night of the Licker – made it easy for the Salinas Police Department to identify the suspect as Arroyo. We were pleasantly surprised the image was so clear, to the point that it didn’t take us long to identify this individual. You kind of laugh about it afterwards because technically he didn’t do anything. This just kind of reinforces how important it is to have security within your home. The suspect, who police say appears to have relieved himself in the Dungan family’s front garden, also headed on over to a neighbour’s property. It is unclear whether or not this was in pursuit of another juicy doorbell. I thought I’ve seen it all, but this takes the cake. Never have we seen anything like this. Officers are still searching for Arroyo, who could now be looking at two misdemeanor charges for petty theft and prowling. The California Highway Patrol have since posted about the alarm-ing incident – with the hashtag #thesnozberriestastelikesnozberries – urging people to contact police if they know of Arroyo’s whereabouts. The footage has left viewers in a weird nowhere zone in between laughter and being thoroughly creeped out. [I] can’t look at a door bell the same anymore. Three hours is a lot of licking. He got stamina. The Dungan family have reportedly since wiped down the delectable doorbell in question.